It seems Salman has found a new high-profile fan in the American hotel heiress and socialite. Of late, Salman Khan has been treating his fans with new posters of his upcoming film Bharat. On Tuesday, the actor dropped yet another character poster of him from the film. In the new poster, the 53-year-old actor is seen sporting a retro look with "1964" and "journey of a man and a nation together" written over it. In this new poster, the actor looks much younger than his age. "Jawaani humari Jaaneman thi!" 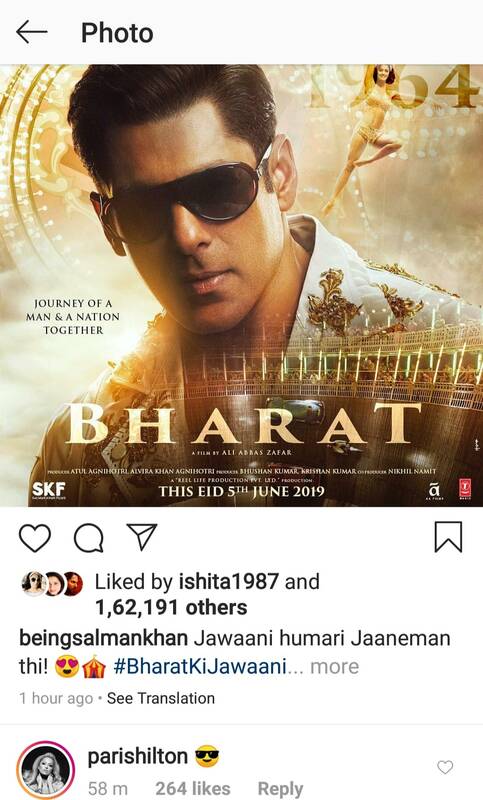 Salman captioned the poster. Soon after the poster was released, American hotel heiress and socialite Paris Hilton dropped a compliment for the poster on social media. She posted an emoticon with sunglasses on Instagram. It's not clear exactly how was the Salman-Paris connection established, but it sure looks like the actor has found a high-profile fan in the Hollywood diva. On Monday, Salman shared his first look from the movie. In the poster, the actor features as an old man, complete with grey hair, moustache, overgrown beard and framed spectacles. The teaser, released earlier this year, gave us some flashes of five different looks that the actor will be donning in the film. In the teaser, his looks range from a kid during the Partition to a miner, a retro biker and an old man venting out on a punching bag, among his other looks. Directed by Ali Abbas Zafar, Bharat is an official adaptation of the South Korean film Ode to My Father. Also featuring Tabu, Jackie Shroff, Sunil Grover, Disha Patani, Nora Fatehi and Aashif Sheikh, Bharat is slated to release this Eid on June 5.